On the negotiation side. Tuesday (4 December) saw the official start of the technical negotiations. That means negotiators are getting into the nitty-gritty of the monitoring, reporting and verifying processes that has to be defined and fed into the so-called rulebook, the document that will implement the Paris Agreement and which has to be officially adopted at the end of the COP24 on 14 December. “The Polish presidency pushes negotiators to be ready with the technical aspects by Saturday,” an EU source close to the talks told EURACTIV, meaning before the political – and most delicate – phase begins next week. The official added that the working atmosphere was good and that there is a genuine willingness among negotiators to deliver as fast as possible. “Of course, you will find some parties that will come up with some special wishes,” the source continued. According to the same EU source, finance as referred to in article 9 of the Paris Agreement was clearly emphasised by the Polish presidency. As it is, article 9 of the Paris Agreement stipulates that developed country Parties shall provide financial resources to assist developing country Parties with respect to both mitigation and adaptation in continuation of their existing obligations under the Convention. Article 9 also states that the provision of scaled-up financial resources should aim to achieve a balance between adaptation and mitigation, taking into account country-driven strategies, and the priorities and needs of developing country Parties, especially those that are particularly vulnerable to the adverse effects of climate change and have significant capacity constraints. “The session on the Adaptation Fund was particularly productive,” the official specified. Clearly a positive note considering that this fund is seen as crucial by developing countries whose fragile economies are already impacted by climate change. Until now, the adaptation fund issue found little interest – and little financing. “A discussion also started on the aftermath of the $100 billion annual scheme from developed countries, which is to end in 2025,” the official said, referring to the goal of jointly providing $100 billion annually by 2020, a promise made by developed countries in 2009 at the COP15 in Copenhagen. An evergreen in UN climate conferences. “It is a bit premature to talk about this at this point of the negotiation,” the official said. Green finance. EU Finance Ministers agreed later in the day to assess brown and green factors for banks’ capital requirements, a significant move into greening the financial flows in Europe – and an important signal towards Katowice. Mandatory disclosure of ESG risks for banks in three years. Capital requirements for banks serve to reduce the risk of default and are in place to ensure banks’ assets, WWF explained. These requirements should as such reflect long-term risks to asset price values and potential systemic risks but to date though, banks have not properly been disclosing climate-related risks, nor are such risks adequately monitored by financial regulators, it said. “The ECOFIN Council decision on these two European Banking Authority reports is an important and necessary step to assess the financial risks posed by climate-related and other ESG impacts, notably the risk of stranded assets. The mandatory disclosure of climate and ESG-related risks for banks is another important advancement,” said Sebastien Godinot, an economist at the WWF European Policy Office. Just transition. Only a week after Germany announced the coal commission will postpone its work to 1 February 2019, from the original end-of-2018 deadline, France’s Prime Minister Edouard Philippe announced on Tuesday (4 December) that his government will drop a set of measures initially designed to foster the energy transition as a reaction to the ‘yellow vest’ protests against new environmental tax on fuel. If France’s announcement did not raise direct comments among negotiators at the COP24, the “yellow vest” movement was nonetheless latent in Katowice. It found its way into the speech of Poland’s President Andrezj Duda on 3 December when he unveiled the “Solidarity and Just Transition Silesia Declaration” that is to complement the Paris Agreement. “Social dialogue is crucial to ensure that the transition to a low-carbon economy is based on solidarity and justice. Solidarity and justice, i.e. where the human being is at the centre; one which, in addition to the need to reduce emissions, takes into account the need to combat poverty, exclusion and social marginalisation and to involve vulnerable groups of citizens in the process of shaping public policies,” he said. The issue of a just transition is also at the core of Germany’s coal commission work, with the Ruhr region (West) and the Lusatia region (East) still relying on the coal sector. That Germany comes to Katowice empty-handed while Berlin wanted to initially present to the world a roadmap on how to phase-out coal shows just how difficult and painful the process is. Climate Risk Index. 2017 was the year with the highest weather-related damage ever recorded, with particularly destructive tropical cyclones. Storms, heavy rains, heat and drought claimed more than 11,500 lives and caused more than $375 billion worth of damage (more than €331 billion), according to the annual Climate Risk Index published on Tuesday (4 December) by Germanwatch, an NGO. Poorer countries are mostly affected: From 1998 to 2017, eight developing countries were among the ten countries with the largest extreme weather losses: Puerto Rico, Honduras and Myanmar, followed by Haiti, the Philippines, Nicaragua, Bangladesh, Pakistan, Vietnam and Dominica. Bad news from developed countries. Carbon emissions from advanced economies are set to rise in 2018 for first time in five years, reversing a declining trend, the International Energy Agency said 4 December. Based on the latest available energy data, energy-related CO2 emissions in North America, the European Union and other advanced economies in Asia Pacific grew, as higher oil and gas use more than offset declining coal consumption. As a result, the IEA expects CO2 emissions in these economies to increase by around 0.5% in 2018, the agency said in a press release. “This turnaround should be another warning to governments as they meet in Katowice this week. Increasing efforts are needed to encourage even more renewables, greater energy efficiency, more nuclear, and more innovation for technologies such as carbon capture, utilisation and storage and hydrogen, for instance,” Fatih Birol, the IEA’s Executive Director, said. But good news from India. India is well on track to achieve two of its three Paris Agreement goals ahead of the 2030 deadline, US-based Institute for Energy Economics and Financial Analysis (IEEFA) finds. “For the first goal, IEEFA predicts that installed non-fossil fuel capacity in India will exceed 40 per cent by end of 2019. And at the current rate of 2 per cent reduction per year in emission intensity of its gross domestic product (GDP), India will likely achieve 33-35 per cent of emission intensity reduction targets a decade ahead of target,” the report reads. To create an additional 2.5-3.0 billion tonnes of carbon sinks – reservoirs that accumulate and store carbon dioxide, through the planting of additional forest and tree cover. World Bank committed. The Washington-based institution announced on Monday (3 December) it will double its current 5-year investments (2021-2025) to around $200 billion, with a significant boost for adaptation and resilience. It said it recognises the mounting climate impacts on lives and livelihoods, especially in the world’s poorest countries, it said in a press release. Actions will include supporting higher-quality forecasts, early warning systems and climate foundation services to better prepare 250 million people in 30 developing countries for climate risks, it said. Poland wins Fossil of the Day Award at COP24. 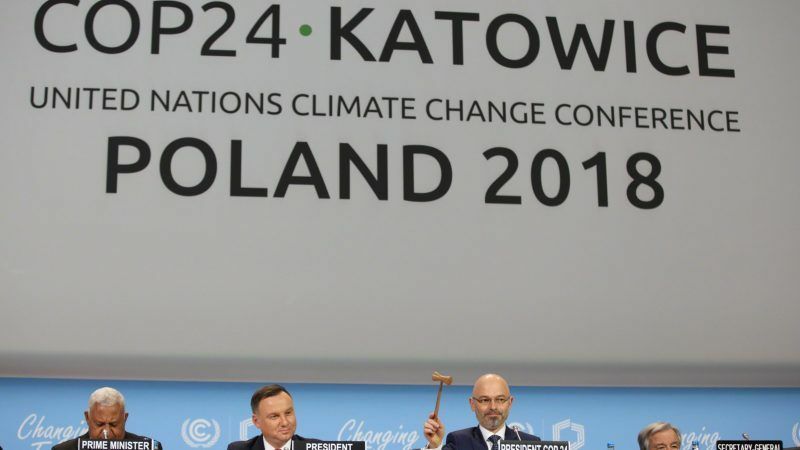 The host of this year’s UN climate summit COP24, Poland won the shameful Fossil of the Day Award from Climate Action Network International today, the NGO announced Tuesday. The award was handed down to Poland for promoting coal interests and turning a blind eye to the need to ramp up climate pledges by 2020, it explained.